Welcome to the Elysium Citizenship Initiative. 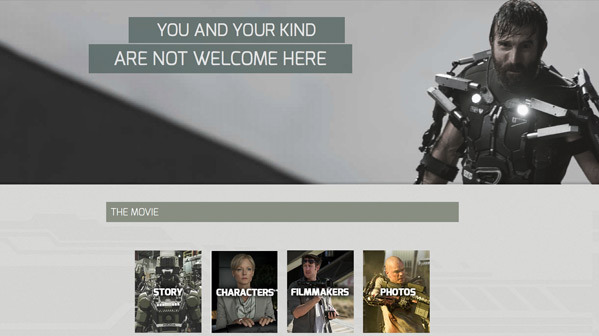 Although this viral website first launched at Comic-Con last year, Sony Pictures has relaunched the "Its Better Up Here" ARG website for Neill Blomkamp's Elysium. Following the awesome trailer debut and premiere of footage around the world earlier this week, they're keeping the buzz going with website relaunches, including a sleek new official site for Elysium that contains some never-before-seen photos and details on the film. This is not a huge update, but I do like this latest marketing refresh, as they're staying true to Blomkamp's sci-fi world. Let's hope it leads to something cool. "Elysium has been offering a luxury alternative to life on Earth since the year 2097. Elysium continues to maintain strict border control in order to preserve its exceptional standard of living. 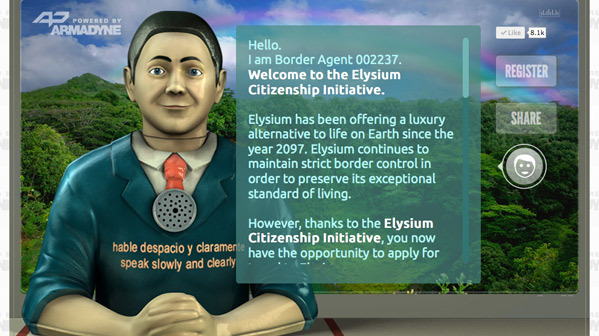 However, thanks to the Elysium Citizenship Initiative, you now have the opportunity to apply for travel to Elysium." Also visit the Armadyne and Elysium viral sites. This first kicked off at Comic-Con 2012 with a Border Agent display. Elysium, directed by South African filmmaker Neill Blomkamp (of District 9), focuses on Secretary Rhodes (Foster), a hardened government ofﬁcial, who will stop at nothing to enforce anti-immigration laws and preserve the luxurious lifestyle of the citizens of Elysium. However, that doesn’t stop the people of Earth from trying to get in, by any means they can. When unlucky Max (Damon) is backed into a corner, he agrees to take on a daunting mission that if successful will not only save his life, but could bring equality to these polarized worlds. Sony/Columbia has Elysium set to hit theaters on August 9th this summer. First trailer! Geez, they should at least give you a way to engage with the site without using Facebook. Yea I know, I agree with you. Marketers are obsessed with Facebook nowadays, most studios won't approve a website or viral unless it's directly integrated with Facebook. :/ Hopefully they open it up further with new updates. They actually did this last year on the "there" site, then changed it to the regular website for Elysium, and now have moved it to the "here" site. So, it's really nothing new, but at least it looks like they are starting it back up again. Yeaaa that's what I thought, but still, everything is up and running again. The best viral marketing campaign I have ever seen still remains to be cloverfield, every other one seems to be, as Alex said, a way to link to a facebook page.